Based on the information from the conflict matrix process, MDS ordination and cluster analysis has been performed on the activity scores per salinity zone and by estuary (Figure 26). 2-way ANOSIM has been performed on the conflict matrix data using the estuaries and salinity zones as crossed factors. This analysis confirmed a significant difference in activity levels amongst the TIDE estuaries, with the Scheldt Estuary distinct from the others. Whilst less clear, the other differences in activity levels were largely observed between estuaries rather than between comparable zones. However, there are some groupings of note within the analysis, with the A groups in general exhibiting higher levels of activity overall, in particular relating to port activities (e.g. land claim for ports, port related use of adjacent land etc. ), as well as industrial activity (e.g. water abstraction and discharge). 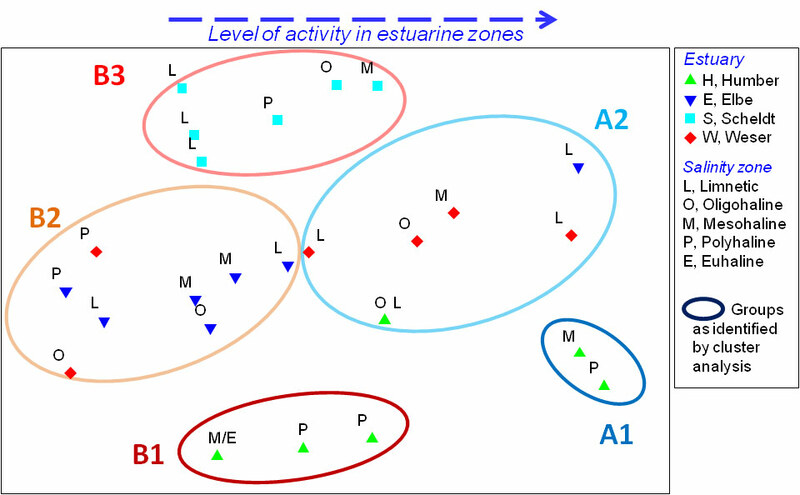 Figure 26: MDS ordination of estuarine zones based on dominant estuarine activities. Group A1 (Humber Estuary - outer mesohaline and inner polyhaline) shows the highest overall level of activity, in particular high port activity, infrastructure on the bed and industrial activity. However notably, no channel stabilisation. This is compared to group A2 which is predominantly comprised of zones from the Weser Estuary which have higher water abstraction. Group B clusters featured lower activity levels, with B1 (Humber Estuary - inner mesohaline and outer polyhaline) showing low levels of channel stabilisation for navigation, recreational access onto the estuary and landscape value, and no port land claim, industrial discharge and water abstraction. Group B2 which is predominantly zones within the Elbe Estuary, features the lowest level of activities overall, with low recreational access onto banks and the intertidal, low infrastructure on the bed, low residential housing, as well as no port activity in the intertidal and subtidal, although with a high value landscape. Group B3 which is predominantly the Scheldt Estuary features high commercial access, aggregate extraction and channel stabilisation for navigation, but low levels of capital dredging and no archaeological features. 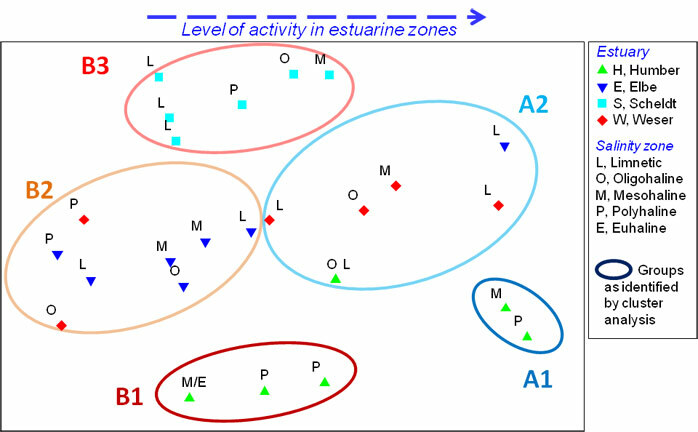 Based on the distribution of uses within each estuary, the analysis allows the identification of estuarine zone groups exhibiting similar types and levels of activity. The analysis indicates that the Scheldt Estuary has a more homogenous distribution of activities across all zones, and thus may require a more uniform management approach, compared to the other TIDE estuaries where there is greater variability between zones, thus requiring spatial targeting of management actions. This homogeneity may allow implementation of management actions to be more readily undertaken in the Scheldt, given a reduced spatial and sectoral variability, although the Scheldt uniquely amongst the TIDE estuaries also has to integrate trans-national boundary management issues. Certainly the results of the RWG conflict matrix assessment indicate that whilst levels of use within the Scheldt Estuary are high (greater than the other TIDE estuaries), severe conflict associations are less frequent within the estuary. The analysis shown above therefore identifies that in most cases there are a number of specific management requirements for each estuary, these requirements based on differing usage levels on a sectoral and spatial basis. As such, there is no common typology of use for each of the salinity zones, with the characterising parameters of use possibly more linked to morphology and use. However. despite this, all estuaries are also identifiable as having specific management requirements, with some clear cross-cutting user conflicts identified from the TIDE estuaries.